"This spring Lux Jewels is hosting their first annual Diamond Race, a race for a diamond and a cure. Based on the concept of the Amazing Race, the Diamond Race encourages couples to compete in various mental and physical challenges to win the ultimate grand prize of a 1 carat GIA certified cushion cut diamond valued at approximately $12,000. "The competition is open to teams of two; couples must be legal residents of British Columbia and over the age of 21. To apply first register on the official website. Then as part of the application process, each couple will be required to upload a video to the Lux Jewels Facebook page telling people why you should be selected to participate in the race. The couples with the most likes or comments by February 14, 2011 will be eligible to compete. Videos will be judged overall on their creativity, unique message and fan interest. Teams will be announced by February 21, 2011. "The Diamond Race is presented by Lux Jewels, a local Vancouver based customer jeweler that offers the finest quality at affordable prices as they specialize in only custom jewelry. Now in their fourth year of business, Lux Jewels’ owner Suman Bakshi saw the Diamond Race as an opportunity to give back to her charity of choice, the Rare Disease Foundation." 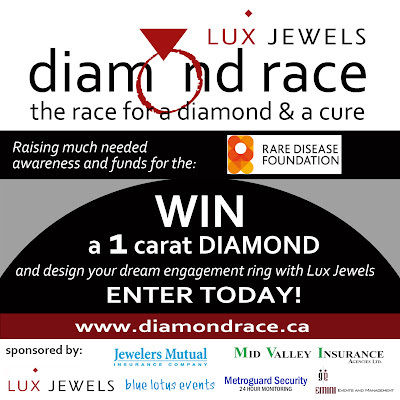 Interested in the chance to win a 1 carat diamond while helping raise awareness for a good cause? Check out the website for more details. oh.. those are seducing.. love it..
hey is it new layout? just fab! i like your new profile picture lisa..